A call to Camper & Nicholsons brings news that Gaston Lees-Buckley has signed Mangusta's 28.3m motor yacht Delhia for sale. 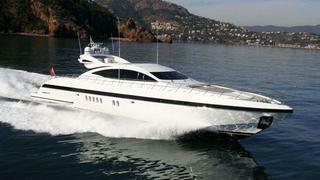 The third hull in the popular Mangusta 92 series, she was built by Overmarine in 2003 to a design by Stefano Righini. An expansive saloon has two large U-shaped settees around coffee tables that can be converted into a dining table and there is a bar and large flat screen television and a home cinema system, all under a retractable sun roof. MCA compliant, Delhia boasts accommodation for up to seven guests in three staterooms. The master suite boasts a private saloon with relaxation room while there is also a double VIP stateroom and a twin cabin. All staterooms have en suite bathroom facilities and entertainment systems. Finally, there is a convertible single cabin for a seventh guest. Special features for outdoor entertaining include a Teppanyaki grill on the aft deck for al fresco dining. Twin MTU 2,000hp engines linked to KaMeWa water jets power Delhia to a cruising speed of 28 knots and a maximum speed of 34 knots. Lying in Cannes, France, Delhia is asking €1.75 million VAT paid.